Via commenter SJ, some rather beautiful pictures from the 2015 Nikon microscopy contest winners. What's up with the jacked up picture link? I can't see the pic either. The 4,4’-dibromodiphenyl is, indeed pretty. I am curious about why the use of polarized light gives the photograph an almost cartoon-like coloring. The coloring effect is due to 'birefringence'. 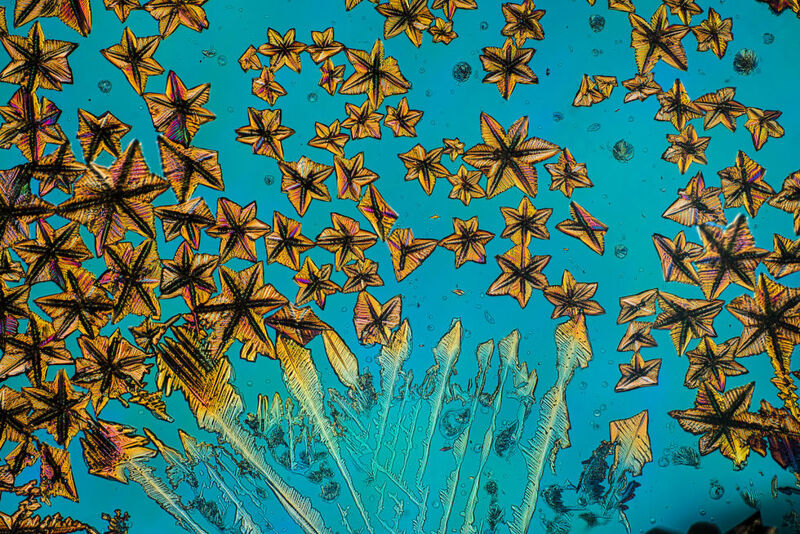 These crystals (and many others) have differing refractive indices depending on relative orientation of light/crystal packing. Perpendicular components of light waves will be affected to different extents, leading to constructive or destructive interference depending on wavelength. The effect is similar to what happens when light interacts with thin films.